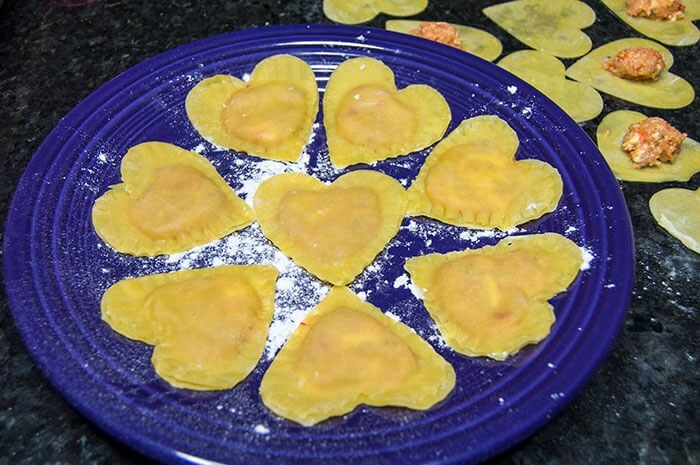 If you're looking to up the ante this Valentine's day by treating your significant other to a homemade meal, then look no further than these heart shaped shrimp raviolis! 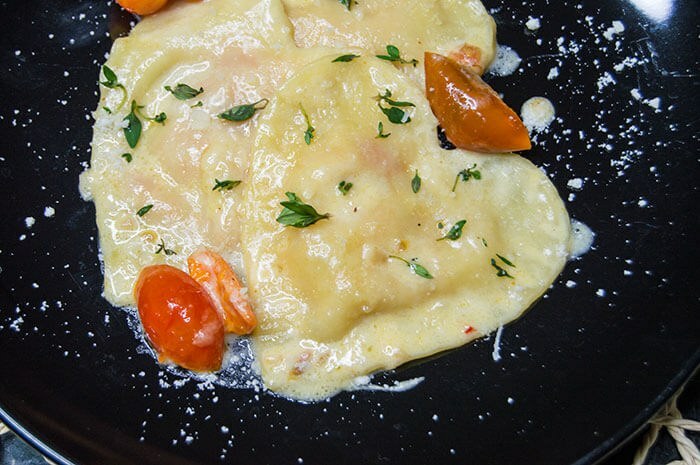 Italian food is best made with love - and with homemade pasta dough and tangy shrimp filling, this ravioli is just as impressive looking as it is delicious. Homemade pasta can be a time consuming process, especially if you don't have a pasta press (which I unfortunately don't). I hand rolled my pasta, but if you have a pasta machine or an attachment for your stand mixer, save some time and use that instead! Pasta is actually pretty simple to make using just flour, eggs and a touch of olive oil. For a sheet of ravioli dough I used one cup flour and two eggs, and two teaspoons of oil. Get your hands in there! 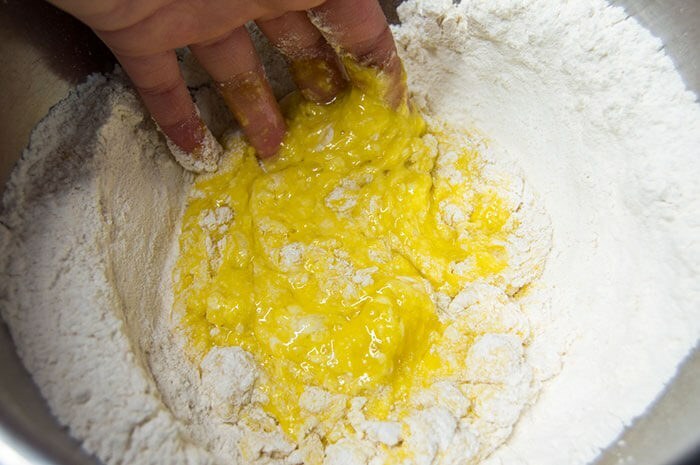 The best dough starts with the hands! 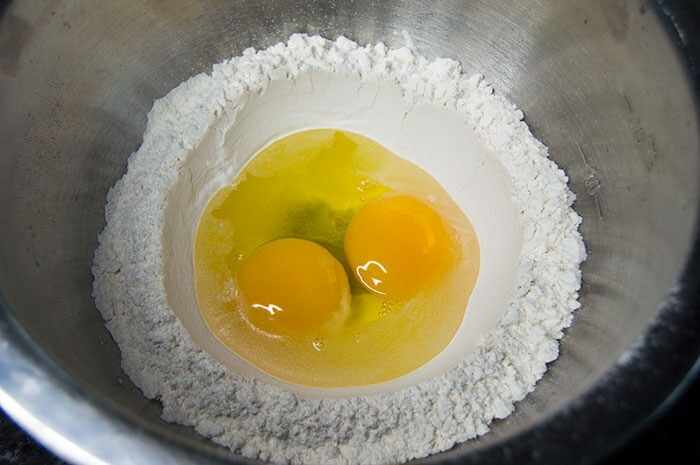 Make a well in the center of the flour with the bottom of a measuring cup and add the eggs and olive oil. 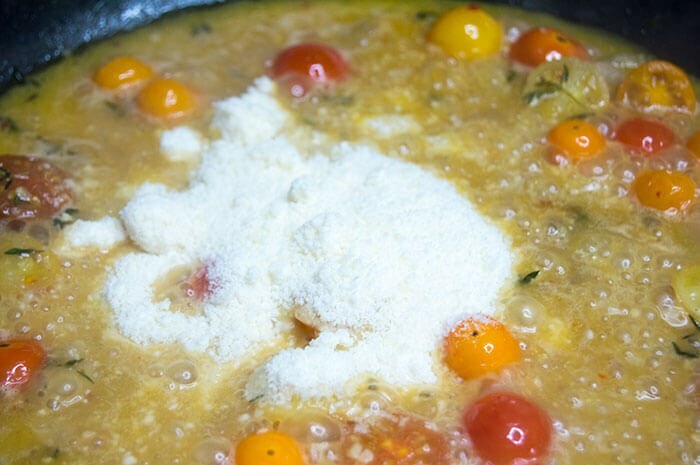 Use your hands to pop the yolks and make a whisking motion so the liquid picks up the flour and begins to thicken. Eventually you'll get a crumbly dough that seems like it will never come together. 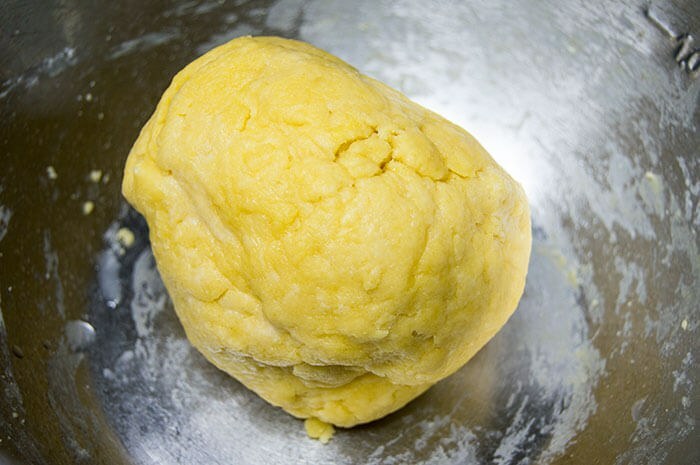 At this point, add another tablespoon of oil and continue to knead until a firm dough forms. Knead the dough for about five minutes then place in a floured and oiled bowl and cover. Let rest for at least thirty minutes to let the flour relax and develop. 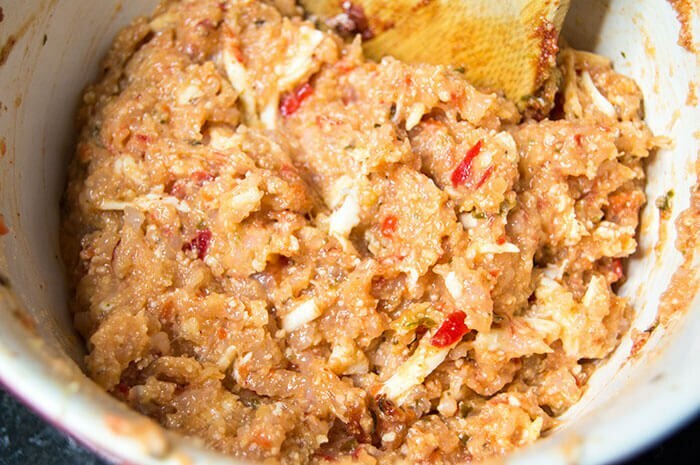 While the dough rests, use a food processor to combine the shrimp, cold butter and spices until a chunky paste forms. I like my filling a little chunky, so I only pulsed my shrimp until they were unrecognizable but not totally paste-consistency. Let the filling chill when it's time to roll out the dough. It won't be nice and puffy like a traditional dough, but it will definitely be noticeably softer at this point. Flour a large working surface - like at least two feet by two feet or wider. You'll need the space as the small ball of dough will flatten out a ton. 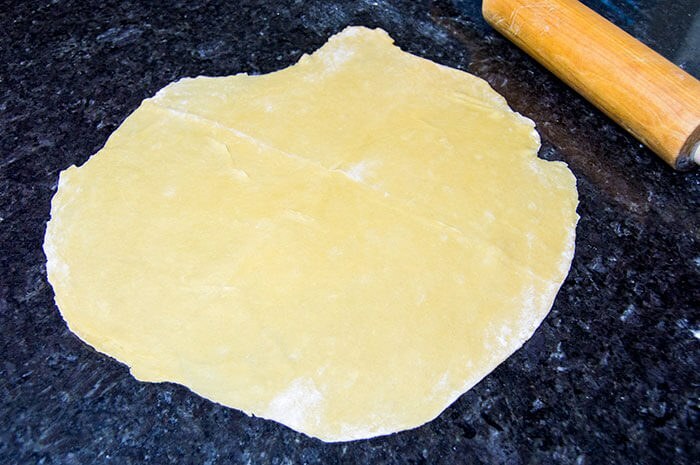 You want the dough to be nearly translucent, that's when you'll know it's ready to form into raviolis. I knew mine was ready when I could see the texture of my granite counter tops through the dough. Chef Michael White says that you should be able to read the time on your watch through the dough for it to be absolutely perfect. At this point, I used a metal heart-shaped cookie cutter to make individual hearts on the dough. 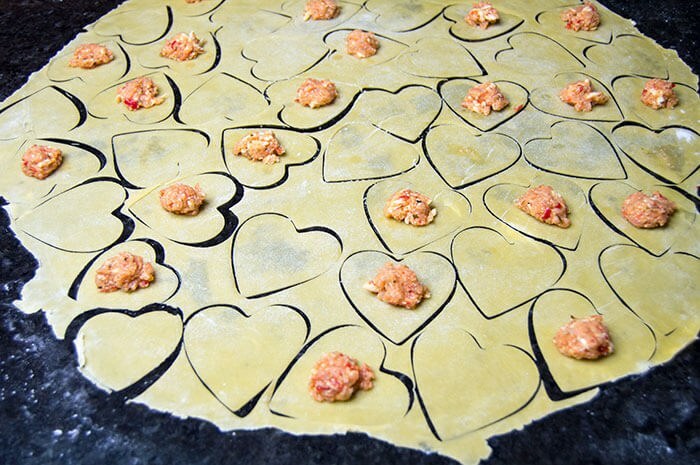 If you don't have a heart shape (or Valentine's day isn't encroaching), you can cut the dough into squares or even circles. 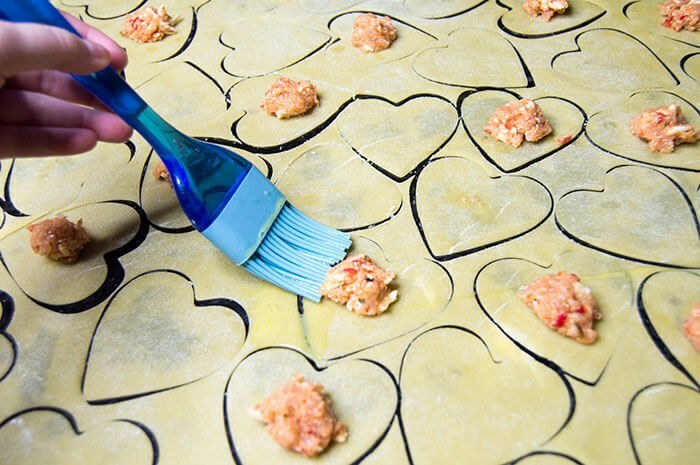 Place about a teaspoon of shrimp filling onto the centers of half of the heart shapes. Then brush on an egg wash when ready to start assembling the ravioli. 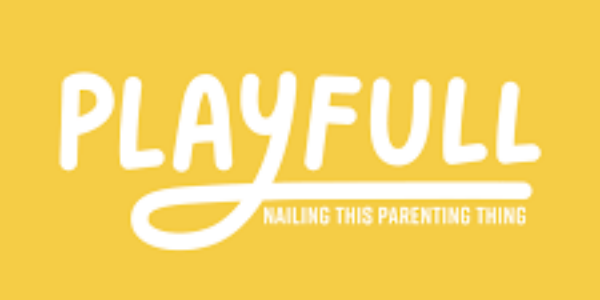 You'll need to work relatively quickly so the dough doesn't dry out - ask your significant other to help for a fun Valentine's dinner date night in. Brush the edges with egg wash then use a fork to crimp the edges of the dough. 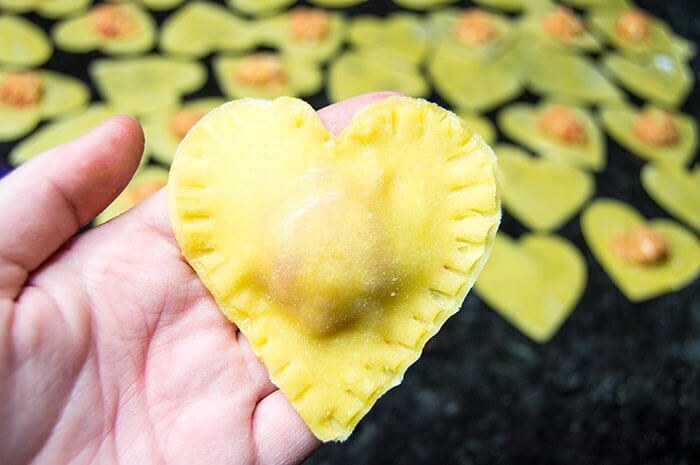 Gently press the filling around the center of the heart shaped ravioli so it is in an even layer. I popped my raviolis into the freezer at this point to help them firm up and the edges dry completely. This ensures the raviolis won't open up while they boil. Meanwhile make the white wine sauce by starting with a nice chunk of butter and sauteing the shallots and garlic until fragrant and browned. Add the wine to deglaze the pan, along with the thyme and red pepper flakes for a burst of flavor. 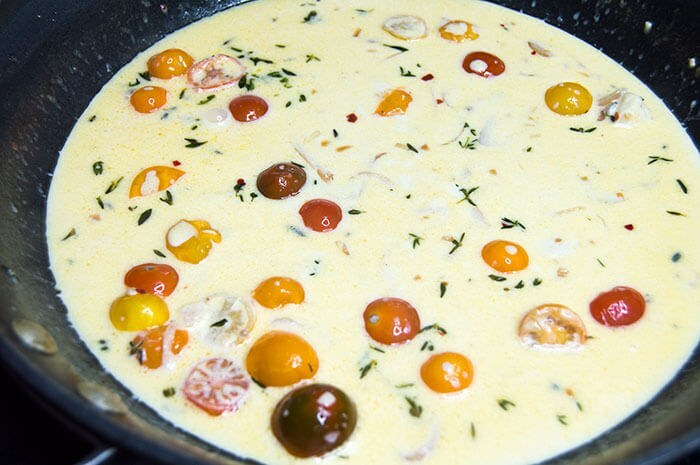 Toss in the cherry tomatoes when most of the wine has evaporated then pour in the chicken stock and bring to a simmer until the tomatoes have softened. I let the cherry tomatoes get soft enough that they easily popped when gently pressed upon. At this point, the sauce is ready for the cheese. Stir in the parm until it's completely melted, then quickly stir in the heavy cream and reduce the heat down to a simmer. 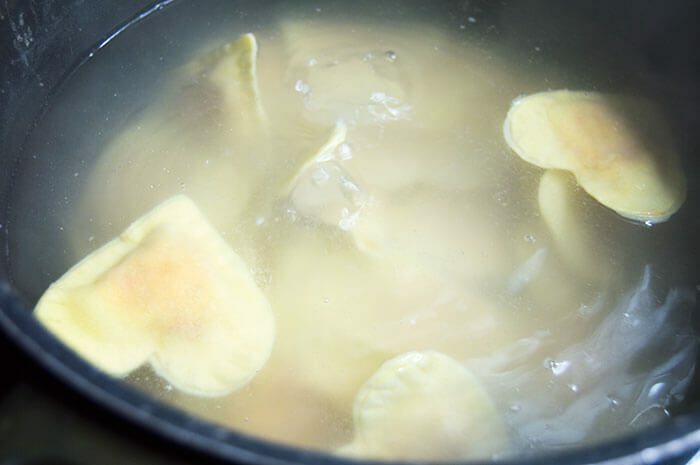 While the sauce thickens up, boil the raviolis for two to three minutes, just until the dough is opaque and the shrimp is cooked through. I transferred my raviolis from the water to the sauce using a slotted spoon, then carefully stirred them into the sauce until they were completely covered in all of it's deliciousness. 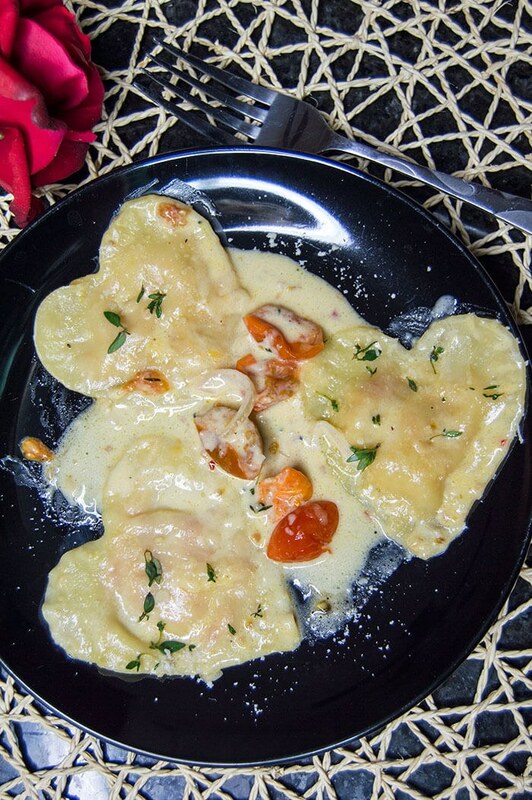 Let the raviolis soak up some of the sauce then serve right away, along with a rose, if you're feeling romantic. 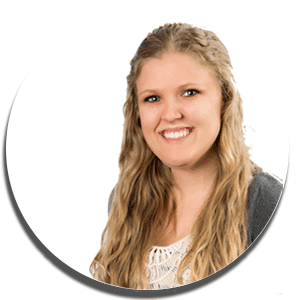 Pour the flour into a large bowl and create a well in the center with the bottom of a measuring cup. Place two eggs in the center along with a teaspoon of olive oil. 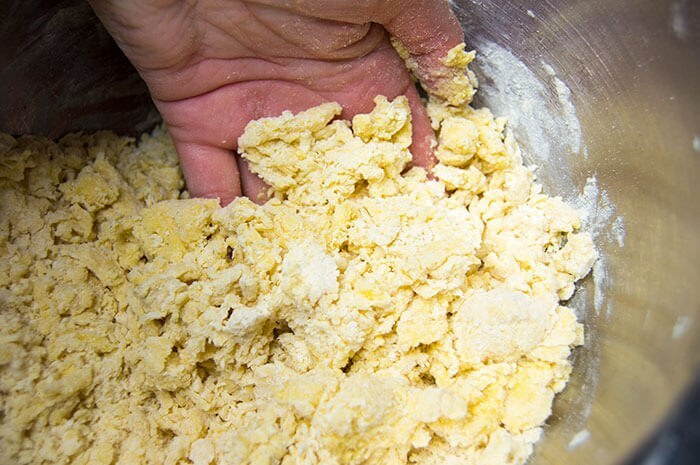 Use your hands in a whisking motion to create a sticky, then crumbly dough. Slowly add in the remaining olive oil and knead until a smooth dough forms. Continue kneading for five minutes. Grease the bowl with oil and dust with flour then place the dough in the bowl, cover with plastic and a towel and store until a warm, humid place for at least thirty minutes. 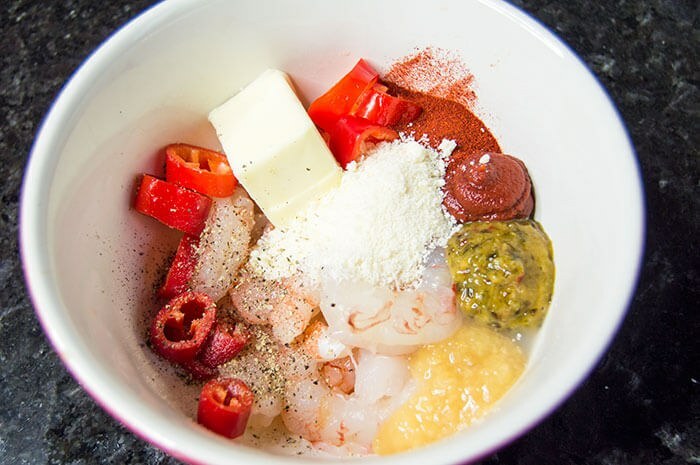 Use a food processor to combine the shrimp, cold butter, ginger, Thai spice paste, tomato paste, lemon juice, red pepper, Parmesan cheese, lemon pepper, sea salt and paprika into a chunky paste-like consistency. Chill until ready to fill raviolis. Dust a large working surface. 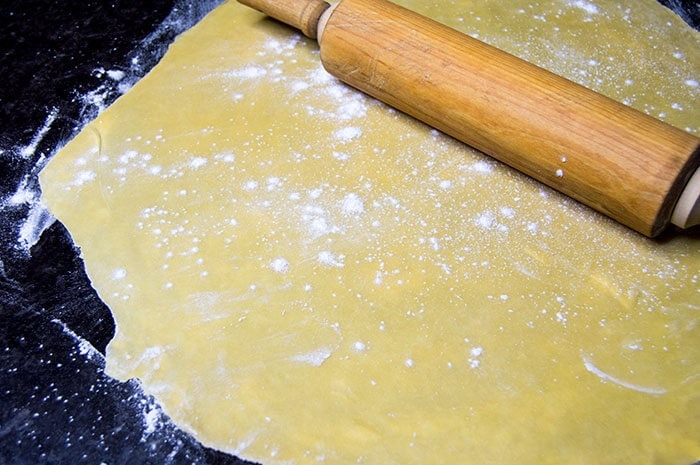 Start by kneading and flattening the dough with your hands, then move to a rolling pin. Continue flouring, rolling out, and flipping the dough until it reaches about 1/8th inch thick. Flour the top of the dough and fold in half. Dust the top and fold in half again, so the dough is folded in quarters. Roll with the rolling pin until about 1/2 inch thick, then unfold the dough. It should now be 1/16th inches thick. Continue rolling the dough, flouring and flipping and rolling some more until the dough is translucent. You should be able to read small type (like the hands of a watch) through the dough when it is thin enough. 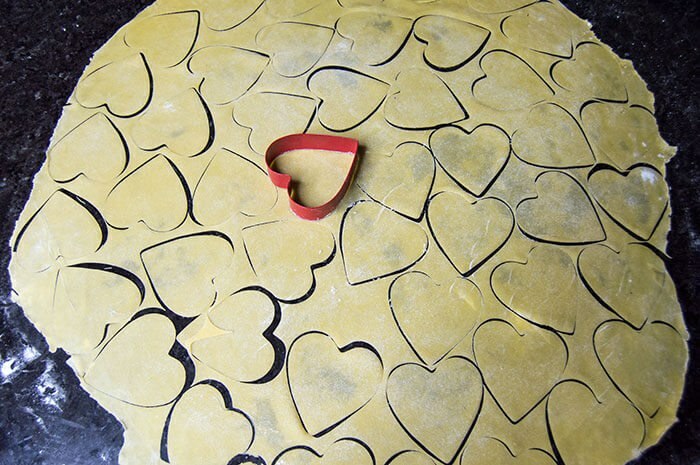 When dough has reached the proper thinness, use a metal heart-shaped cookie cuter to create individual heart shapes into the dough. Use a teaspoon to measure out filling for half of the raviolis - the other half will be the tops to seal in the filling. Whisk together the egg and water then use a brush on the edges of each ravioli. Place a second heart shape on time and press the edges together. 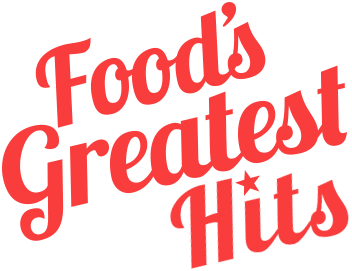 Use a fork to 'crimp' the edges. Place completed raviolis on a floured plate. When all the raviolis have been made, place the plate in the freezer until ready to cook. 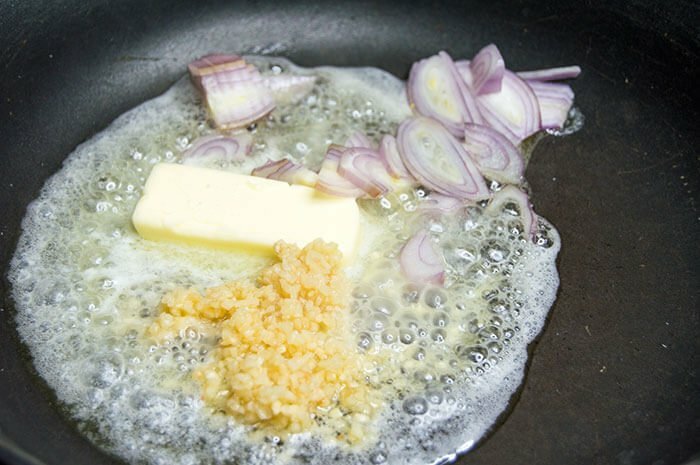 In a large skillet over high heat, melt the butter until frothy then add the chopped shallots and garlic. Stir until fragrant and browned. Pour in the wine and scrape up any brown bits as the wine deglazes the skillet. Add the thyme and red pepper flakes to the skillet. 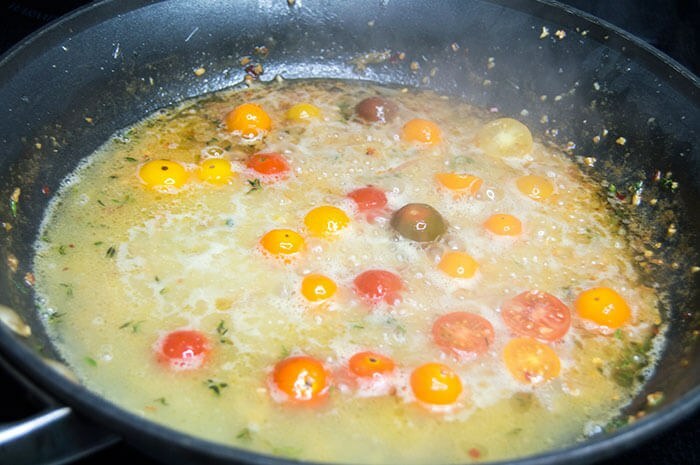 Cook until most of the liquid has evaporated, then stir in the cherry tomatoes. When the tomatoes are browning, pour in the chicken stock and bring to a boil. Cook until the tomatoes pop when gently pressed on, about ten minutes. Meanwhile, bring a large pot of water to a rolling boil. Add the raviolis and cook until the pasta is translucent and the shrimp is cooked through, about 2-3 minutes. As the ravioli cooks, add the Parmesan cheese to the sauce and stir until melted. Pour in the heavy cream and reduce the temperature to a simmer and let the sauce thicken for 2-3 minutes. Use a slotted spoon to drain and transfer the cooked raviolis to the sauce. Gently stir to coat the raviolis and season with salt and pepper, to taste. 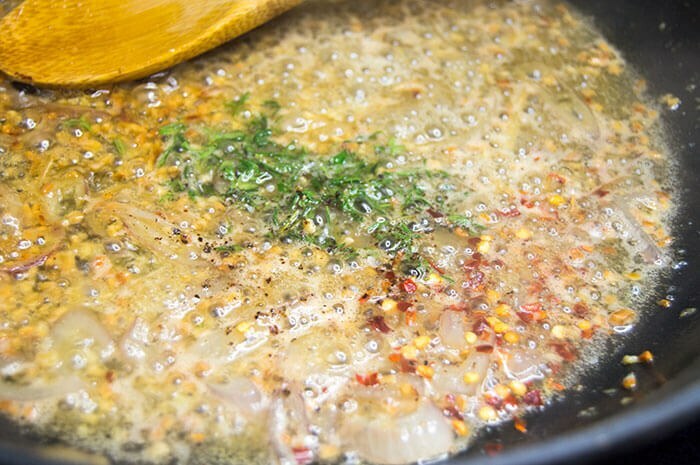 Serve the ravioli with a spritz of lemon juice and garnish with fresh thyme. Serve with a kiss, and enjoy!